The Giants and Saints played a game on Sunday at in New Orleans that resembled a video game, as Drew Brees and Eli Manning set an NFL record with 13 touchdown passes between the two. Sadly for the Giants, a late penalty by punter Brad Wing opened the door for new Saints kicker Kai Forbath to kick a 50-yard field goal at the buzzer to send New Orleans to a 52-49 win. The loss drops the Giants to 4-4 on the season, and wastes an incredible outing by Manning, who threw six touchdowns and ended the day going 30-for-41 for 350 yards. 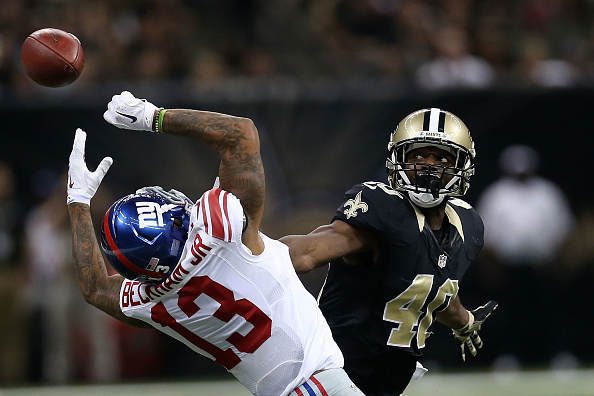 New Orleans native Odell Beckham Jr. was Manning’s favorite weapon, pulling in three of his six touchdown passes. ”Their offense is always high-powered. I thought it might be a day where we were going to have to score some points,” Manning said. With the game tied late at 49, the Saints forced the Giants to punt from their 25 with 20 seconds to go. Marcus Murphy returned Brad Wing’s punt 24 yards across the 50 and fumbled, but Saints Willie Snead recovered the ball. Wing may have been better served punting the ball out of bounds. Instead, he tried to make a tackle, but was flagged for a facemask. That penalty set up the winning kick on Forbath’s first field goal attempt with New Orleans, which signed him before last week’s victory at Indianapolis. It was the fifth winning field goal for the former Redskins kicker and tied his career long. The win also spoiled a great comeback from Manning and the Giants, as the G-Men trailed at one point 42-28, but he rallied them to back to even at 42. The Giants took the lead 49-42 when Trumaine McBride recovered a fumble and returned it 63 yards for a score with 7:23 left to play. Brees threw his 7th score with 41 seconds to play, hitting C.J. Spiller down the middle for a 9-yard score to get the game to 49 all. The Giants couldn’t run out the clock, causing Wing to have to punt and then the mistake on the facemask allowing the Saints to kick the winning field goal. The Giants will play at the Buccaneers next Sunday.